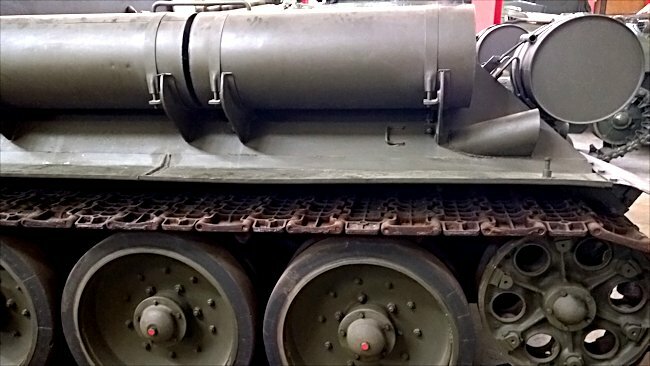 This SU-100 Russian Soviet Tank Destroyer SPG can be found at the Deutsches Panzermuseum in the small military town of Munster, Germany. The SU-85 Tank Destroyer was developed after the German army had a nasty surprise during operation Barbarossa, when their Panzer III and IV tanks ran into Russian KV-1 and T 34/76 tanks. The German tank's armour was too thin and their guns could not penetrate the frontal armour of these new Soviet weapons. The German's response was the Tiger tank, followed by the Panther tank. It was now the Soviet army that had problems penetrating the thick armour of enemy tanks.. The Russians needed an interim solution fast whilst bigger and better tanks were being developed and produced. The German's had found out in Poland that their 88 mm flak gun was extremely good at killing enemy tanks. This is why they put it in the Tiger tank. The Russian's 85 mm anti-aircraft gun also had very good tank armour penetrating power. It was converted into an anti-tank gun. Spare fuel tanks were fitted to the rear of the SU-100 Russian Soviet Tank Destroyer. Crews had to manually transfer the fuel to the internal tanks when they were running low. There was no internal switch. The original plan was to put the D-5S 85 mm anti-tank gun straight onto the T 34 tank's turret but it was just too big. It had to be totally redesigned and this took time. Eventually the very effective T34/85 tank with the rollout of the Russian factories. 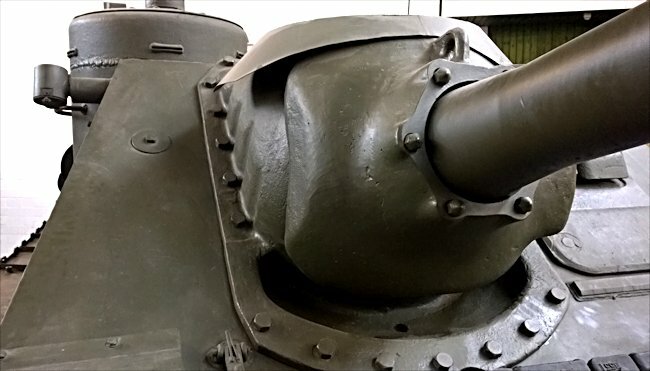 Whilst the Soviet generals were waiting for that to happen, they came up with the idea of mounting 85 mm anti-tank gun onto a T 34 chassis in a tank destroyer configuration. This was going to be the first Russian tank destroyer. They had built infantry support assault guns before, notably the SU-122, that were designed to fire high explosive rounds rather than armour piercing shells. The SU-76 was used as field artillery and also as an assault gun to breach German strong points. Both these self-propelled guns could fire armour piercing shells but not at very high velocity. The SU-85 was designed to hunt and kill tanks, nothing else. It was a purely stop gap vehicle as a way of getting this 85 mm anti-tank gun into a mobile armoured tracked platform, onto the battlefield, to take on the mighty German Tiger tank as quickly as possible. 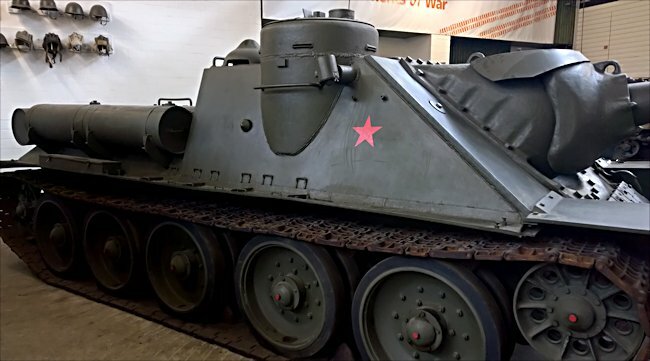 The SU-85 tank destroyer was only in production for a very short space of time, just two years between 1942-1944. By the time the T34/85 was in full production. There was no need to continue making the SU-85. The first SU-85 Tank Destroyers to take part in active service reached the battlefield combat units to take part in the counter-attack after the first German assault in the Kursk area of Russia in August 1943. They were deployed in support of other tanks or together in what the Russians called flying hunter squads. They were often attached to command tanks. When information was received about problematic groups of German Tiger or Panther tanks, that the T 34's and KV-1s were having difficulty dealing with, they would be dispatched to that location. 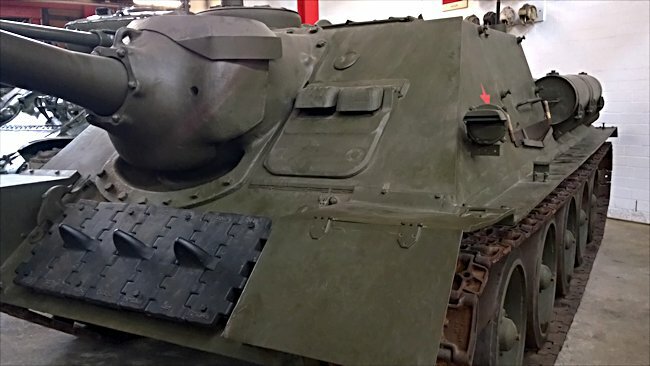 The rear armour was slopped on SU-100. It was bolted and hinged for access to the engine. History has a way of repeating itself. Just when the Russians believed they no longer needed a tank destroyer, their tanks came across the German Ferdinand and Jagdpanther tank destroyer, followed by the King Tiger tank and the Jagdtiger. These vehicles were difficult for the T34/85 tanks to knock out. The Russian engineers knew they needed to work on a better anti-tank gun. They developed the D-10S 100mm anti-tank gun. It was rushed into service on T 34 tank chassis as a tank destroyer whilst bigger and better tanks like the Joseph Stalin IS-2 tank was being developed. The SU-100 tank destroyer was another stop gap solution just like its baby brother the SU-85. The new gun could knock out the sloping armour on the Panther tank at 1500m away, which is just under a mile. It was also able to penetrate 125 mm of vertical armour at a range of 2,000m (1.2 miles). Which meant it could kill any Tiger I tank front on. It was not just the gun on the SU-100 tank destroyer that was improved. The frontal sloping armour was increased from the 45 mm on the SU-85 to 75 mm thick but still had the same hard to see low profile. 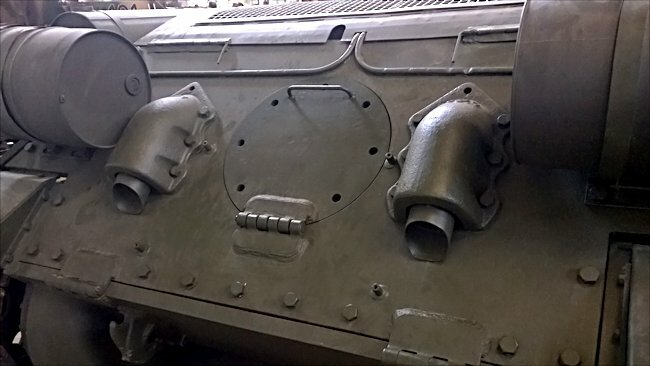 These pipes at th rear of the SU-100, by the right of the rear red navigation light at the back of the tank destroyer, were used to pump out smoke. The SU-100 saw extensive service during the latter part of the Second World War. Many were used in Hungry during the battle of Lake Balaton. By early 1945, the SU-100 and totally replaced the SU-85s. After the war both these two tank destroyers were used to equip satellite communist countries, like Poland, East Germany, Hungary and Romania, during the early years of the Cold War. They were withdrawn from active Soviet service in 1957. Many were exported around the world. 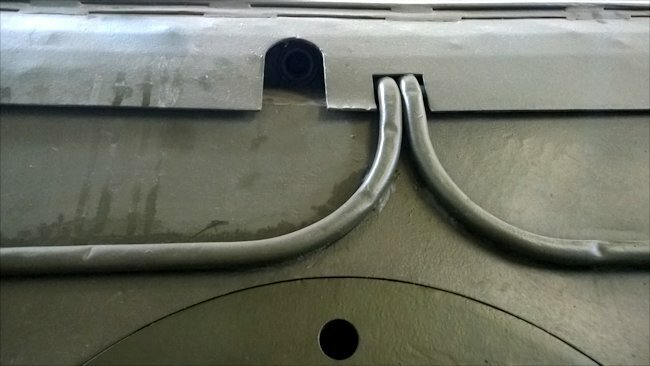 Spare track was bolted to the front of the SU-100 for extra protection.